Many Australians have limited contact with our Indigenous People and never get the chance to experience the beauty of Australian Indigenous Culture. The greatest fear is that this culture could be lost if we don’t take steps now to protect it. At Surfside Primary we have decided to do something about that. On Monday July 27 our school received brand new Aboriginal and Torres Strait Islander flags from Kerry Ridgway representing Sarah Henderson, our local member for Corangamite and flew them proudly. We also welcomed Toni Bowen from the Department of Education and Uncle Dave Tournier, elder from the Wathaurong community who performed the Welcome to Country ceremony. 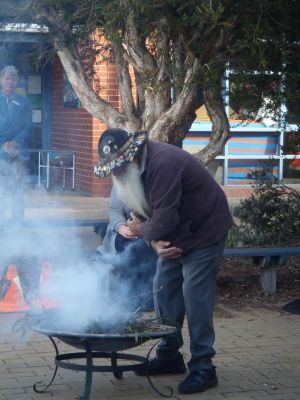 Welcome to Country and/or Acknowledgement of Country is a fundamental first step for us as a school in developing positive and meaningful relationship with the local indigenous community. As a Kids Matter school we are always looking for ways to be inclusive and develop a strong sense of community. The Welcome to Country ceremony demonstrates respect for all indigenous people and acknowledges the spiritual, physical and cultural connection their ancestors have with their 'country' as the first people of the land now known as Victoria. 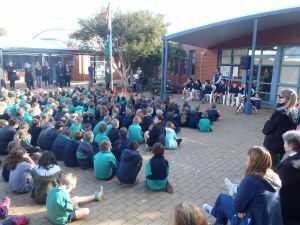 The connection to land is a reminder to all of us of the importance of ‘belonging’ and the sense of pride in ourselves and the lands known as Surfside Primary. It is our hope that as our children journey through Surfside they will have fabulous memories of great fun, education and friendship. With the help of some wonderful parents, we are also developing a beautiful Koorie area in our playground for children to enjoy. It is a pleasure to acknowledge the traditional owners of the land and be part of a community that is welcoming to all.